We all love that singing bear, and his human pal. The songs, the memories and magic. And now you can relive this Disney classic in Hi-Def Blu-Ray for your whole family to sing along with. 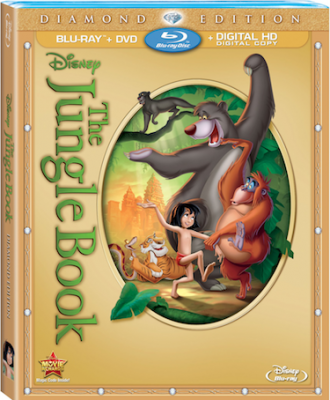 Now for the first time ever on Blu-ray with glorious digital high definition, Disney’s Jumpin’ Jungle Classic has never looked so lush or sounded so good! Beloved characters, swinging music and new behind-the-scenes bonus features make this Diamond Edition Blu-ray a must-have for every family’s classic collection! Meet the most unforgettable characters and embark on a thrilling adventure with Mowgli as he journeys deep into the jungle and learns “The Bare Necessities” of life from happy-go-lucky Baloo the bear. Meet Bagheera, the wise old panther, and crazy King Louie, the orangutan. But watch out for the cunning tiger Shere Khan and Kaa, the ssssneakiest snake in the jungle! Explore your family’s wild side as you venture into The Jungle Book for extraordinary adventures and a heartwarming tale that celebrates the true meaning of friendship. **Inspired by the Rudyard Kipling Mowgli Stories. Music by George Bruns, Songs by Robert B. Sherman and Richard M. Sherman.